High Definition Videos of Fun and Interesting Things to See and Do in the Carolinas! Watch videos directly on our website or on your favorite connected TV device via the HD Carolina channel. An almost magical place in the forest. 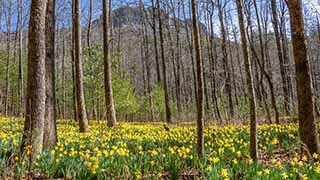 Once a year, thousands of daffodils bloom at this special place in Linville Gorge. With Autumn officially starting this month, there isn't a lot of color left in the year with regards to flowers. The trees will make their big show in the coming weeks with the fall foliage but flowers, for the most part, are finishing things up. The bees are frantically making their final rounds collecting as much pollen as they can before the pollen tap runs dry and another cold winter sets in. There are, however, a few spots in the Carolina's where flowers are making an encore appearance before the last curtain call of the calendar year.